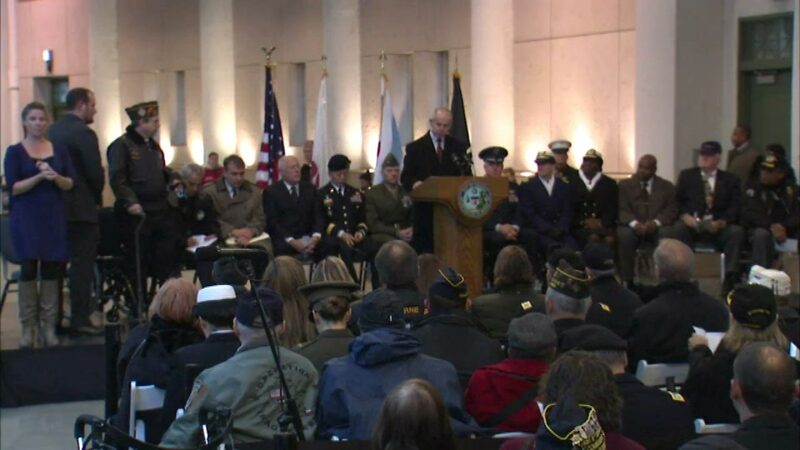 WHEATON, Ill. (WLS) -- Chicago honored our country's veterans during a ceremony at Soldier Field Wednesday. Some of the men and women who served said they attend this event every year. Many talked about the pride they felt serving their country. Several spoke of showing their support for their fellow veterans, and one Vietnam veteran said it was important to pay tribute to those who never made it home. "58,479 souls did not come home. So I'm blessed. I'm here representing them. Calvin Coolidge kind of said it best when he said, 'The nation that forgets its warriors itself will soon be forgotten,'" said Jim Hobson, a veteran. Mayor Rahm Emanuel, Gov. Bruce Rauner, Sen. Mark Kirk and Congresswoman Tammy Duckworth were among those taking part in the ceremony.